Purchase Discounted Demo EGG’s while they last! Purchase a Discounted Demo EGG while they last! Pre-assembled kits will be available on a first come first serve basis. Large EGG kit: EGG, Nest, ConvEGGtor & a 20lb. Bag of Charcoal. XL EGG kit: EGG, Nest and a 20lb. Bag of Charcoal. Welcome to the 2019 Athens Eggfest! 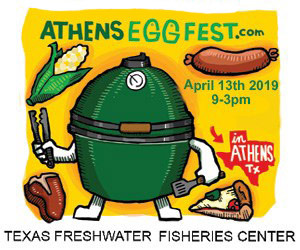 It gives us great pleasure to announce that the Texas Freshwater Fisheries Center, along with the support of Morrison Supply and Paragon Distributing, will once again be hosting the Athens Eggfest, this coming April 13th. The event will be held on the grounds of the Texas Freshwater Fisheries Center in Athens, Texas and will feature culinary delights as prepared by our seasoned Egghead Cooks. A limited number of Demo Eggs will also be available for purchase immediately following the event. To register as a COOK for the 2019 Athens Eggfest, please click HERE. To reserve a DEMO EGG for your purchase, please click HERE after January 25th. Our 2019 Cooks include . . .
We’re very pleased to announce that the following teams will be joining us in 2019 . . .
Steve Grant Real Estate is proud to be the newest sponsor of the 2019 Athens Eggfest. In support of the event, we will be awarding one lucky Facebook Follower a large Big Green Egg setup – complete with the BGE, a “nest”, and platesetter (Suggested retail value of $1,100.00). Contest entries will be accepted through noon on Friday, April 12th, with the drawing to take place at noon on Saturday, April 13th during the event. The winner must also agree to take delivery of their prize by 4:00 p.m. on the day of the event at the Texas Freshwater Fisheries Center, or contact Steve Grant Real Estate by 5:00 p.m. on Tuesday, April 16th to make other arrangements. DELIVERY OF THIS PRIZE IS THE RESPONSIBILITY OF THE WINNER. Should the winner NOT identify themselves and claim their prize prior to April 16th, an alternate winner shall be selected. GOOD LUCK and we hope to see you at the 2019 Athens Eggfest!!! Find us on Social Media . . .